Hot on the heels of our marvellous coverage in Cross Stitch Collection Magazine, we are happy to announce the launch a new kit. Snowdrift Cottage is a new little gingerbread house that you can make as a Christmas tree decoration or stand-alone ornament. It has candy canes, a Christmas tree, a wreath and plenty of other delightful little details. 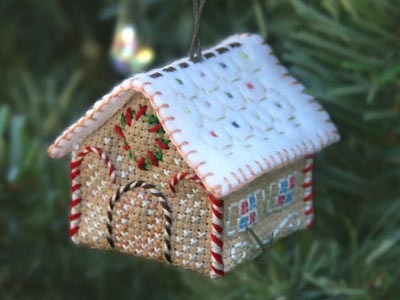 However, Snowdrift Cottage is a little easier than our other gingerbread cottage and many of our other cottages. 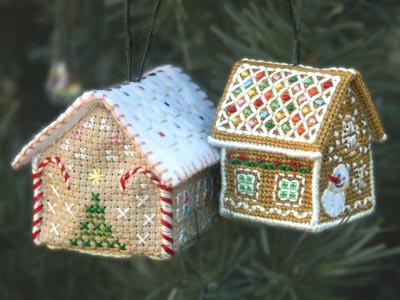 Snowdrift Cottage uses only cross-stitch, back stitch and whip stitch (with a little blanket stitch around the roof) on 14 count coloured Aida fabric. The larger count and fewer stitches involved make this quicker to finish and a somewhat easier than other projects. You can read more about the kit here. We think Snowdrift Cottage makes a lovely addition to our range of kits and is an ideal Christmas gift for every stitcher who has mastered the basics and wants to progress a little further.